My wife and I like to get out of the house, and give ourselves the occasional treat. If its a nice day we will probably go out in the car, to visit perhaps Bury St Edmunds, a near bye market town, or perhaps, Clacton-on-Sea, or to Cambridge, or wherever. And every so often, if we can get a good discounted ticket deal, we go into London, to visit the West End Theatre, usually for a mid week matinee performance. We used to just go into London, and take pot luck at one of the discount theatre ticket shops round the corner from Leicester Square tube station, but of late we have found it better to book our discount tickets over the internet. I am always puzzling what to add to my web site, so I thought, why not write something about the shows that we see. I have started to write this section in October, 2012. My wife and I have been visiting West End Theatres, say half a dozen times a year, for goodness knows how many years. The memory is not what it used to be, but even if I could remember all the shows that we have seen, there would be little point in trying to go back into the past. I have however gone back just a little to January, 2012 - simply to start off with some sort of list. I also thought I would try a little attempt at catch up, and do a short ramble about a few Shows that we had seen. These are not really the highlights, just some random observations. Sweeny Todd. The 39 Steps. The Woman in Black. Dreamboats and Petticoats. One Man, Two Guvnors. The Phantom of the Opera. Billy Elliot, the Musical. Hay Fever. Some people are a bit "sniffy" about Andrew Lloyd-Webber musicals, but not me. They have all been excellently presented, and I would be guaranteed to come out of the theatre, whistling some catchy tune. This I think is the real test of a musical. The Phanton of the Opera was excellent, but ran for years before they started to discount the tickets. So we had seen the film, knew all the songs and the story, and seen excerpts on television all before we saw the stage show. Excellently done, but it felt as if we had seen it before. I'd loved to have seen Michael Crawford as the Phantom - what a glorious voice from such an unexpected source. (But we did see Michael Crawford years later as the wizard in The Wizard of Oz). Still on the subject of Lloyd-Webber, however, we did enjoy his sequel to Phantom, Love Never Dies. There seems to have been a bit of an unfair campaign againt this, and some called it "Paint Never Dries" implying it was too long, and boring. Some friends of ours saw it, and didn't like it. By the time we saw it, however, AW-B had revamped it slightly, and cut the running time. I really enjoyed it. Sierra Boggas played Christine, the Phantom's desire, and gave a beautiful performance. I still remember her stepping forward to central stage, and singing Christine's Aria with a perfect voice, soaring gloriously to hit some impossibly high notes with apparent ease. What a song, what a performance, and that alone I thought was well worth the price of the ticket. We also saw, and liked Jesus Christ, Superstar , and The Sound of Music , but not with Connie Fisher who had won the part in the Lloyd- Webber TV series "How Do you solve a problem called Maria". I saw Legally Blond by myself, as my wife had flown out to Australia to represent the two of us at our grandson's christening. Most of the audience were ladies, and when the heroine decided to dress as she pleased and struck a note for women's liberation, half the audience were on their feet cheering. I kept my head down, greatly outnumbered. Wicked had a good story, and a scary monster that flew high up around the theatre. Wonderful staging. Talking of flying, I also loved the entrance of Mary Poppins , flying in from the sky with her umbrella to land on the stage. We did manage to get discounted tickets for Mamma Mia , but it took years of waiting, and likewise I think we didn't get much discount when we finally got tickets Billy Elliot . I liked "Billy Elliot", and the film "Brassed Off", a similar anti Thatcher tirade as entertainment, but neither could claim to be in any way politically balanced. I sometimes wonder why the theatre / most playrights sometimes appears to have a definite left wing bias? I just wanted a short introduction, and already I have gone on for too long. We've seen all sorts of entertainment on the West End Stage - musicals, plays, revues, magic shows, etc, etc. With very few exceptions, all have been done to the very highest of standards - you just can't go wrong with an established West End Show. I like them all, but if pressed, I think my favourite show would be a musical, and within that probably it would be one of the old classics, with hit song after hit song after hit song. These old classics never seem to have much of a story, but with a great swing orchestra, excellent choreography, terrific scenery, and strong lead singers belting out showstopper after showstopper, I think they are unbeatable, and a visit to the theatre is true magic ! I have just lifted this photo off their handbill - hope no one minds. It shows "Cassie" played by Scarlett Strallen. The weather in February and March, 2013 had been terrible - most weeks it was too cold and wet for us to visit Bury St Edmunds, or go to the seaside. We had been trying lots of times to get discount theatre tickets to see a West End show, but with no luck. So, when we eventually got a good deal - two stalls seats at �36.50 each (�35 off) to see "A Chorus Line" at the London Palladium (in Argyll Street near Oxford Circus) - it was quite a relief to get to the theatre once again. Our seats in the stalls were R1 and R2, quite a bit back, and the rows were not very well raked, so we would have struggled to get a good view, but luckily the rows behind us were empty. We moved back a couple of rows, and with no one in front of us, then got a good view. The original show "A Chorus Line" opened on Broadway in 1976 to rave reviews - it was the longest running musical in Broadway history. And this UK revival was also getting excellent reviews. So I was sort of looking forward to seeing the show - but only sort of. I didn't really fancy the story - it's just an audition for a chorus line. And so it proved in practice. The dancing was energetic and excellent, and I thought that the orchestra was brilliant. But yes, I would have preferred a better story line where things happened, and there were changes of scene. This was just various dancers doing an audition to get parts in a chorus line. The dancers have to introduce themselves, and say why they want to be a dancer, haranged by the voice of a producer coming from the back of the theatre. The dancers' stories were remarkably similar. One of the Strallen sisters, Scarlett, was dancing in the show. Initially I failed to recognise her, thinking that she was blond. My wife recognised her as the redhead "Cassie". and remarked that she looked remarkably like her aunt, Bonnie Langford. As soon as she said that, the penny dropped with me too. Scarlett danced very well - an excellent performance. But all the dancers were very good - it wasn't a star/ leading lady kind of show. There were two big hit numbers in the show - "One (Singular Sensation) ", and "What I did for Love." All in all, this was a successful revival, very well received by the audience. So possibly I am the only one who was a little disappointed. I would give it three stars, not five stars. It was two hours long with no interval. Some of the dancers, as part of the storyline, complained that they could do with a break. I could have done with one too. I much preferred "Top Hat," and at a later awards ceremony I noticed that "Top Hat" beat "A Chorus Line" for best new musical. That said, the fact that "A Chorus Line " was nominated, shows that most people thought it was very good, just not me. I have just lifted this photo off the Telegraph review - hope no one minds. 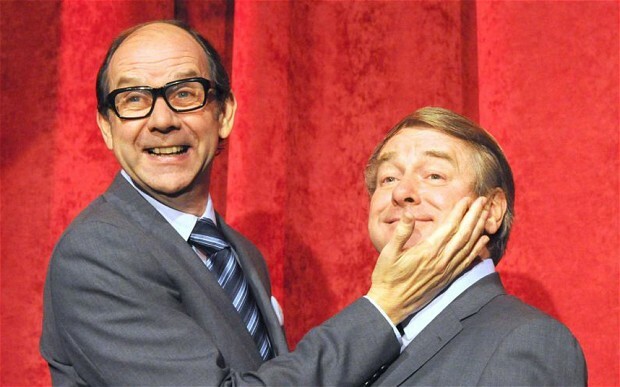 We paid �50 for two discounted dress circle seats to see Eric and Little Ern, a Morecambe and Wise tribute, at the Vaudeville Theatre. The performance started very early at 13:30, and we were out again at 15:10 - but that was OK as we then had plenty time to see the West End 2013 Christmas lights, before heading home. At the theatre, our seats were "upgraded" to two premium seats in the stalls, but on inspection, the seats there weren't really raked, and we would have had difficulty seeing the stage had someone tall sat in front of us. So we asked to sit in the seats that we had booked. This they allowed us to do but we were then the only two people in the dress circle - but yes we did have a perfect view of the stage. When we were shown to our seats in the dress circle we were told we might as well sit anywhere as we would be the only folk there - but when we later moved forward a little, an usherette informed us she had been told to tell us that we could only sit in the seats we had booked. It seemed a little petty - why this was I have no idea. At the interval the same usherettte did however ask us if we wanted to buy like an ice cream - which was nice, I thought. I'm not sure what I expected of the show - perhaps a retelling of the Morecambe and Wise life stories. It sort of did this. Jonty Stephens as Eric, and Ian Ashpitel as Ern were excellent - eerily they looked like Morecambe and Wise, talked like them, and captured their mannerisms perfectly. But whilst they were very good, it all seemed a little dated. The magic of Morecambe and Wise was missing. The show was mostly 90 minutes of pleasant banter between Eric and Ernie - a lot of the jokes were just as good as ever, but now very familiar. I thought they got better as the show went on, but it was all over in 90 minutes - and I thought this was about the right length, and �25 a seat about the right price. Whilst it was a brilliant recreation of Eric and Ernie, I could have done with a few updated perhaps topical jokes. Had Eric and Ernie still been alive they wouldn't be doing the same material all these years later ! There are a lot better shows on in the West End - perhaps it was a show you would expect to see at a local theatre, but on the West End stage. I've seen better shows, but I've seen worse ones too. But I wouldn't rate it as a top rate West End show. A long time ago I saw a Tommy Cooper tribute play in the West End that went into Tommy's character, and didn't just rehash his stage performance. That was done a lot better I thought. I have just lifted this photo off the internet - hope no one minds. The Shaftesbury Theatre is at the far end of Shaftesbury Avenue, on the corner with High Holburn. It is here that we saw "From Here To Eternity," at a matinee performance at 2:30 pm on Saturday, 8th Feb, 2014, paying �35 each for two discounted seats to the Royal Circle (H27 and H28), and buying them from the Love Theatre website. With this site you can see the actual seats on a seating plan of the theatre before you buy. They were good seats with a good view of the stage, and with a seat face value of �67.50 each, were bought at a good discount. A few weeks earlier we had seen Lloyd Webber's excellent "Stephen Ward, the Musical" and thought it was a 5 star show. 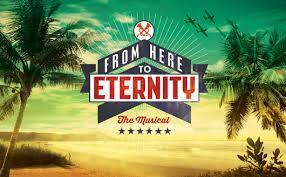 "From Here To Eternity" had lyrics by Tim Rice, Lloyd Webber's former musical partner. Unfortunately we didn't think "From Here To Eternity" was nearly as good - say a 3 star show if we were to give stars. Of course, being a West End production, there was nothing wrong with the staging - all the singers were very professional, and had good voices. It was quite a big cast with a chorus of 12 girls, and 12 boys who all sang together beautifully - a great choir, really. And there was a big, powerful, excellent orchestra. We both thought that the second half was the better half - but somehow, the show just didn't capture our imaginations, and I didn't really warm to the characters. Perhaps it was too big a story, having to be told too quickly, with such a lot happening at the same time, that we didn't have enough quiet time to connect. What was the story line ? It was set in 1941, in a GI camp in Hawaii where the soldiers were marking time awaiting the outbreak of war. Private Prewitt, a 30 year man (but only 5 years in), is transferred there. He is an ex boxing champ, and "the best bugler in the whole US army", but now he refuses to do either. Apparently he badly injured a friend in the ring, and doesn't want to fight any more. He no longer plays the bugle as a self punishment. There is a culture of bullying at the camp, and they set out to break Prewitt, who is not to be broken. Col Holmes is in charge. He betrayed his wife some 8 years ago and they are now living together only in name. His wife has an affair with one of the colonel's sergeants. And Prewitt finds a special girlfriend, Lorene, and goes AWOL, but takes up his bugle again to play "Last Post" when his best friend Maggio is bullied and beaten to death. The bugle playing was well done ! There were no show stopper hits for me to whistle when I left the theatre. All in all, a good show, and we enjoyed the performance, but nothing special. The leads were Darius Campbell, who was very good and an imposing presence as the sergeant, Rebecca Thornhill as the colonel's wife, Robert Lonsdale as Prewitt, and Siubhan Harrison as Lorene, Prewitt's girlfriend. They all performed and sang very well. So whilst there are better things to see, the show was OK.
We saw this on 27th September, 2012, at a Thursday afternoon matinee, in the Piccadilly Theatre - just up from the Piccadilly Circus end of Shaftesbury Avenue on Sherwood Street. We had paid �76 to Lastminute.com for two excellent third row, Royal Circle discounted seats. I don't think I had been in the Piccadilly Theatre before - or perhaps it's just I had never been in the Royal Circle before. The seats were comfortable, there was lots of leg room, and best of all the seats were so sharply raked, that we had no problem seeing over the heads of those sitting in front of us. Usually with a good discount deal we find ourselves in the front stalls where the rows are only slightly raked, and we have to lean to the side to get a good view. Surely all seats in a modern theatre should give a good view of the stage - but then of course most of the London theatres are old buildings - beautiful, yes, but out of date when it comes to access, amenities, and the all important view. This was a stage setting of the famous Ghost movie, and the stage adaptation stuck faithfully to the same storyline. Its a strong story of a young successful high flying banker Sam Wheat and his partner / sweetheart Mollie Jenson. Sam and Mollie are head over heels in love. But then Sam is murdered. His ghost "stays behind" to be near the grief stricken Mollie. There is a lot more to the story - suffice to say Mollie is in danger, and Sam turns to a medium to try to warn Mollie. Sam was played by Mark Evans (26). I had watched the TV series, but didn't recognise Mark as a finalist in the Lloyd-Webber, 2010 show "Your Country Needs You" - a show to pick the country's Eurovision entry. Mollie was played by Siobhan Dillon who also had a Lloyd-Webber connection - she came third to Connie Fisher in the 2006 TV series "How Do you Solve a Problem Like Maria" Both were excellent, and great favourites of an enthusiastic audience. One nice closing touch was that after the final curtain call, they stayed in character as Sam and Mollie, went off hand in hand, and paused at the back of the stage to embrace and kiss each other - the ghost and Mollie, reunited. I must also mention the medium Oda Mae Brown - played wonderfully by Sharon Clarke. I hadn't heard of Sharon before, but later found out that she is not just a good singer and actress, but is also a musical judge of choirs and on TV shows. Sam, Mollie, and Oda all started off with American accents, but Mark, Siobhan, and Sharon are all British. I have just lifted this picture from the internet - hope no one objects. 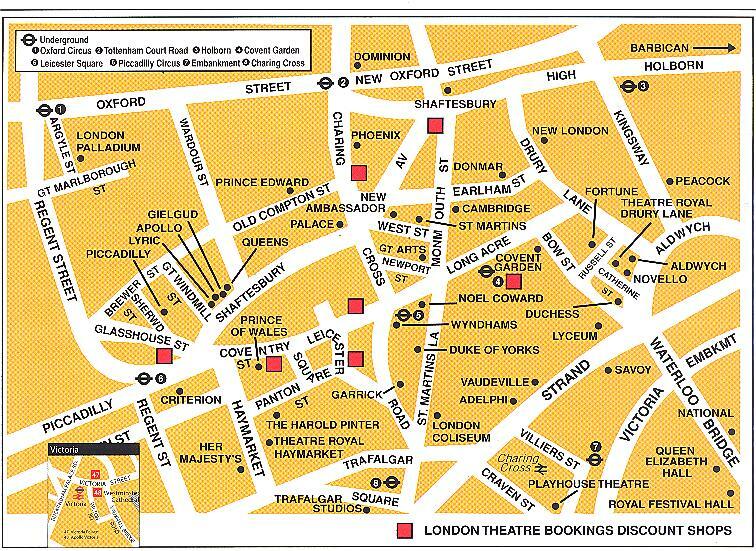 We saw this on 10th March, 2012, at a Saturday afternoon matinee, in the Noel Coward Theatre, on St Martin's Lane - from the Leicester Square tube station, walk along Long Acre towards Covent Garden, turn right into St Martin's Lane, and the theatre is is just on your right. We had paid �61 to Lastminute.com for two seats in the stalls. This play is a classic comedy, had got good reviews, and we had heard of the lead Lindsay Duncan, so we thought we would try something slightly out of the usual for us. The play was written in 1924 by a young Noel Coward, and we did enjoy it, but it's just a little dated now. It is set in the sitting room of the Bliss family, who are well off, live in the country, and have invited guests for a weekend house party. However none of the Bliss family have a practical bone in their bodies, and each is selfish, and very self centred. No one seems to have told each other that they have invited someone for the weekend, no food has been ordered, and Judith Bliss (Lindsay Duncan) is a famous actress rather getting on in years who just wants to bathe in everyone admiration. There are no scenery changes, and it all seems a bit static now. It's well written, clever and very witty, well presented, and well acted. I quite enjoyed it, but it's not a must see. Definitely something different. We got two excellent discounted tickets to see "I Can't Sing" at the London Palladium. The seats were in the front row of the Royal Circle (A5 and A6)- we had a perfect view of the stage with no one in front of us, and no hand rail to obstruct the view. A few days after we got the tickets (�32.50 each from Love Theatre ) it was announced that the show would close early on the 10th - two days after our visit. Two recent shows that we saw ( From Here to Eternity, and Simon Ward, the Musical ) also had to close early. I hope we are not jinxing these shows. "I Can't Sing" is a spoof of X-Factor, the TV talent show. It sends the show up time after time. It pokes fun at the contestants, the judges, especially Simon Cowell's ego, and the sob stories that the contestants relate to camera. They had spent a lot of money on the show - it was very bright, very colourful, very energetic, and there were some excellent special effects. The cast sang and danced with great energy and enthusiasm, and the two main characters - Nigel Harman as Simon Cowell, and Cynthia Erivo as Chenice, the girl singer with a good voice, were excellent. And of course there were lots of laughs. So why has the show closed early ? I think that they had just booked too large a theatre. The Palladium seats about 2,500 (I think ?) - just too many seats to fill night after night. Also the show was very silly - way beyond silly, really - but it set out to be silly, and never took itself seriously. I think a show needs a bit of balance, of light and shade. Everything was very superficial, and I wasn't really rooting for any of the characters. It was also all too predictable. But what it was trying to do, it did do very well, and a lot of the audience gave it a standing ovation at the end. So, all in all, I guess it could have had a long run in a smaller theatre. Although it was silly, it was well done silly. It was done professionally, and I liked to lyrics and dialogue (Harry Hill). I thought it was different, but OK. I'd have given it 3 stars. It could have benefitted from a substantial smash hit song. That said, the song "I Can't Sing" was very good , and allowed Chenice, the girl singer, to belt out and sustain some very high notes. It's shame the show didn't make it. On top of all of this, there was a spectacular, way over the top ending, but of course very silly ending. Perhaps they should have given the audience credit for a little more intelligence. It's a shame if they lost a lot of money on this venture. I was more surprised that "Stephen Ward, the Musical" had to close early. I thought that show was excellent, and really deserved a longer run. I didn't think "I Cant Sing" closing early was a travesty - unfortunate, but not such a surprise. Once again I have just lifted this picture from the internet - hope no one objects. It seemed a long time since we had last visited a West End Theatre. It was August 2014, the school holidays, and we hadn't been able to find any good discounted seats to anything we had been waiting to see. There were some good discounts around for shows that were perhaps not our first choice, and of these we picked Jeeves and Wooster - Perfect Nonsense. This was on at The Duke of York's Theatre in St Martin's Lane, and so we found ourselves in two excellent seats (A15, A16) in the front row of the Royal Circle, and since there was no guard rail, we had a perfect view. The seats were �57.60 discounted to �35 each. This was our first visit to The Duke of York theatre - it's a small theatre, but we have been in smaller. It's very easy to find - we had a cup of tea or whatever in the Crypt of St Martin's Church on Trafalgar Square, then when we came out, turned right, walked away from Trafalgar Square, along St Martin's Lane, past the Coloseum, and the theatre was a very short distance away, on the opposite, left hand side of the road. I don't rave about Jeeves and Wooster - I can't recall reading any of the books - perhaps my loss. I might give them a go some time. Like everyone, though, I know of the stories from numerous TV adaptations - the humorous adventures of a high society, dim witted, hopeless man about town Bertie Wooster, set in gentler times when landed gentry and people of wealth had servants, country estates, and led an idle privileged life. Bertie Wooster had the cream of all gentlemen's gentleman - the all knowing, suave Jeeves. The stories are incredibly silly, full of coincidences and endless complications, but Jeeves always comes to Bertie's rescue in the end. I thought this might be OK for a change, and I was quite surprised at how extraordinarly well it was all done. I can mention all the cast - because it was a cast of only three, each doing incredibly quick costume changes to play several roles. 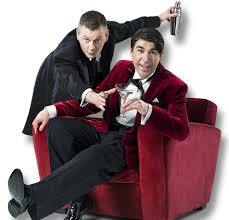 James Lance was a perfect Bertie Wooster, and John Gordon Sinclair simply nailed Jeeves. Robert Goodale played Seppings - another gentleman's gentleman. And all three played a multitude of other parts of both sexes. John Gordon Sinclair even played two parts of different sexes at the same time - his clever costume meant he was a male if he stood with his right side to the audience, and female if he stood with his left side to the audience. The story is a typical Bertie Wooster yarn. Bertie's aged aunt wants Bertie to visit the Bassets country retreat and "acquire" a silver cream separator jug that her husband, a mad collecter of silver ware, simply must have. Madeleine Bassett had been wooed by Bertie in the past on behalf of his best friend and newt loving Gussie Fink-Nottle, was currently engaged to Gussie, but if the engagement fell through, Bertie, as first reserve, would have to marry Madeleine - not a pleasant prospect. So there is mayhem and confusion upon confusion. 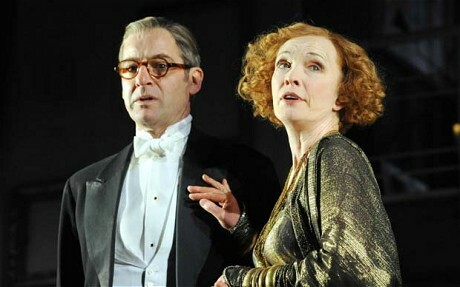 The play started very gently with Bertie on a bare stage speaking to us , the audience, saying that he was going to tell us a story, but since there was nothing to acting, he would act the story for us with Jeeves to assist. Jeeves had been fore warned, and was in the ongoing process of preparing bits of simple scenery as the play proceeded. Each little bit of scenery that Jeeves wheeled onstage really surprised and impressed Bertie, and more and more bits were added as the story unfolded, until we ended up with a full set of scenery and a stage that revolved powered (only just) by the pedalling efforts of the aged, wheezing Seppings. We didn't crease ourselves with laughter, but we did enjoy their efforts and it was generally more than OK - I would say 3 stars overall, but the cast deserve 5 stars for energy and effort. The three actors did what the did excellently - I don't think anyone could have done it much better. It was something different, and we ended up quite enjoying it. 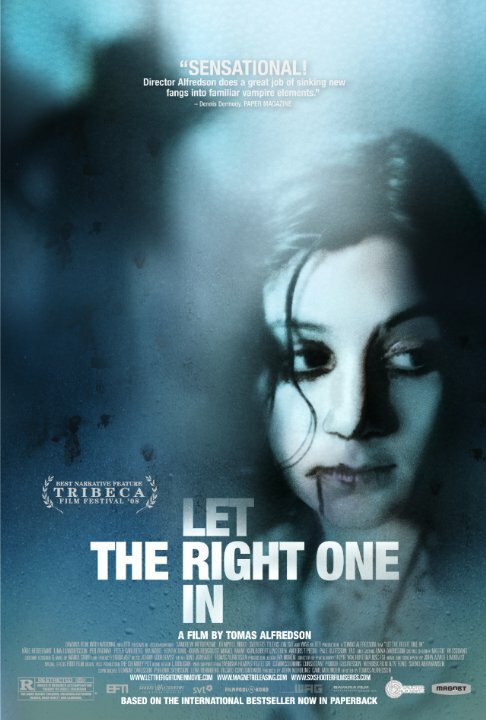 We saw an offer for �30 dress circle seats to see "Let the Right One In" at the Apollo Theatre. We did a quick check of the reviews - mixed to say the least, someone gave it golden raspberries, but the Daily Telegraph gave it 4 stars. I wasn't sure, but we decided to give it a go. We did have two good seats in the dress circle, C10 and C11, and moved back a row to get an even better view. But we did have to crane our necks to see action at stage floor level at the very front of the stage. I knew the story as I had seen the film. A young girl and her "dad" move into a desolate house next to Oscar, a young lad. The girl and the young lad become friends - even though the girl confesses she is not a girl. Oscar is a wimp, and is being bullied at school, but the girl is more than able to fight Oscar's fights for him. In short, the girl is a vampire like creature, and her "dad" is her carer who kills and gets blood for her, but is now getting older, and less able to provide for her. The production was a bit slow, especially in the first half - but equally you could argue that this was the deliberate creation of atmospheric eeriness. The stage was a fixed scene - a view of a secluded wood, snow on the ground, and a climbing frame in a clearing. The climbing frame later converted into a side view of a swimming pool - but they hadn't really spent a lot on props and scenery. It was the sort of production you would expect at a fringe theatre. There was eerie music and sudden bursts of activity that took the audience by surprise. People sometimes moved in unison, in a strange dance. Overall I would give it 2.9 stars. What it was trying to do it did successfully, but in the West End I really wanted more of a production spectacle. So nothing wrong, really, just not my cup of tea. As an aside, the Apollo was the theatre where part of the ceiling had recently fallen on top of the audience (during a production of "The Curious Incident of the Dog...."). I think it was something to do with the use in hessian to hold up ceiling tiles in the late 1800's theatre construction, and with water ingress, the hessian had rotted. There was a theatre back cloth stretched over the ceiling with an evening sky scene painted on it in keeping with the current production. I have just lifted this picture from the internet - hope no one objects. The characters are left to right, Mary, Charlie, and Frank. It had been about 3 months since we last visited a West End theatre - we just had not been able to find any good discount deals ! This is the first time we had visited the Harold Pinter Theatre. It is in Panton Street which joins the bottom of Leicester Square with Haymarket. It's a sort of middle sized theatre - we have been in bigger, and been in smaller. We paid �55 in total for two seats in the stalls - row M, seats 13 and 14, and we had a good view of the stage. However, there were two pillars in row M, and so some of the seats behind us had restricted views. I really enjoyed the play - it was an unusual story, told backwards in time. It started at the end, and rolled back through the years to reveal how things had come about. It was well staged, and well performed - all three leads were excellent, but I especially liked the actor who played Charlie, who reminded me of the great Eric Morecambe. It was a real West End production, with a great orchestra. All that said, though, perhaps it was just ever so slightly on the long side. It was the story of three friends (or former friends) - Mary, Frank, and Charlie, each greatly talented. Mary was an accomplished writer who wrote a stunning first novel, but then wrote no more. Frank was a musical composer, and Charlie his lyricist. They could have been the best, but Frank sold out, and spent his time more in self promotion and making money, than to composing, and so Charlie eventually had had enough, and left the partnership in disgust. We open with a party at Franks. He is surrounded by shallow hangers on - yes he is rich, but he not fulfilled, nor happy. Mary is also at the party, but drunk. Charlie had left the scene long ago. As time scrolled backwards we see how it all came about - all the mistakes, all the wrong decisions. And eventally we are back at the beginning - three people so full of talent, promise, and vitality - all squandered. It was a real bitter sweet tale, a terrific story, and I really liked it. I have just lifted this picture from the internet - hope no one objects. It shows the two main leads - a talented single young Irish musician who meets a married Czech classical pianist. We saw Once, the Musical, at a Thursday afternoon matinee performance at the Phoenix Theatre on Charing Cross Road on 25.07.13. 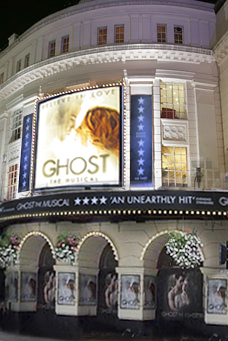 We paid �79 for two dress circle seats discounted to �35 each. We could have got them a little cheaper elsewhere, but we paid commision to / used the See Tickets web site so that we could get seats in the dress circle, and see where the tickets were on a seating plan, before buying. The seats were in row F, 25 and 26 and gave an excellent unhindered view of the stage. The view got even better in the second half, because the people in the row in front us us - some mature ladies - didn't return from the interval. I don't think that the show was their "cup of tea", and to be quite honest it wasn't really mine, either. I would rate it OK to good. It was all well done, and well sung, by two excellent leads. I thought the cast was terrific - were they musicians who could act, or musically talented actors ? But it was a sort of folk / rock musical with a very flimsy story line that didn't really go anywhere. I get the point that not going anywhere was the story, but the music lacked a big hit for me to emerge whistling, and many of the songs seemed repetitive. The show was due to start at 3:00 pm, and we got to our seats at about 2:45 only to find that show had "sort of" already started. The stage had been set up as what appeared to be a bar (it was really a music shop in Ireland where lots of shops also seem to be bars), and some of the theatre audience were on stage buying drinks from the bar at the back of the stage set. In centre stage, a group of folk singers / musicians were busking. At 3:00, the members of the audience had drifted back to their seats, leaving the busking musician - actors performing centre stage, and this merged seamlessly into the show. A young Irish lad had joined in with the buskers, and then went on to perform a song of his own composition. This performance captivated a young Czech girl who worked in the bar / music shop. With great humour, she persuaded the young lad not to abandon his music, but to persevere with his singing / composing / guitar playing. But the young girl was married with a sweet young daughter. And so, boy meets girl, boy and girl fall in love - but this time the girl is a wife faithful to an absent husband. She did say to the lad that she loved him, but only in Czech - and he never knew her feelings because she mistranslated when he asked what she had said. They met / fell in love / nothing came of it / and they parted. So I wasn't really overwhelmed. On the other hand, the musician-actors were very good, and some of the non rock numbers were sung beautifully in harmony. Some of the audience stood up at the end and gave a standing ovation. But I didn't join them - like the ladies in the row in front of me, it wasn't really my "cup of tea". It was all done very well, and the cast were great, but the story was flimsy, and the guitar rock songs were repetitive - I thought. "Relatively Speaking", a comedy by Alan Ayckbourn, had been getting good reviews, and we quite wanted to see Felicity Kendall in the flesh - so when we saw that discounted tickets were available, off we went to SeeTickets.com, and to cut a long story short, we got two excellent seats in the Royal Circle, D25 and D26, for �65 in total. It was on at Wyndhams Theatre, in Charring Cross Road - this is just across the road from the Leicester Square Tube Station. It is a smallish theatre, but we had perfect seats with an excellent view of the stage. There were only four characters in the play - two actors, and two actresses. I think nowadays we are suposed to say four actors - some actresses talk of themselves as actors. Felicy Kendall and Max Bennett played the older couple with a lovely home in the countryside, and Kara Tointon and Jonathan Coy played the young couple with a flat in London. All were excellent, but I especially liked Felicity Kendall and Max Bennett. The first question to ask of a comedy is - was it funny? It had a bit of a slightly slow start setting the scene, but the first scenery change found us out in the country where a series of misunderstandings started, and yes, then it was funny. The Kara Tointon character had been having an affair with an older married man, but was now in love with a young man who had proposed to her. She was supposed to be off to the country to see her mum and dad - but really she was off to tell the older man to stop pestering her. The young man also decided to go to the parents house, to ask the dad for his daughter's hand in marriage. But he gets there before his girlfriend, and meets an older coupe whom he believes to be the mum and dad, but who have no idea who on earth he is - and so the misunderstandings begin. It's funny, with excellent lines, and good comedic acting. When the interval arrived all too soon, I thought that the time had simply flashed by because I had been enjoying it so much. I did enjoy it, but part of the reason it flashed by was because the play was only two acts of 45 minutes each. The total running time was one and a half hours. We got in at 2:30, and were out at 4:20 ! On the other hand we missed the rush hour conjestion on the Leicester Square to Walthamstowe Central tube journey home. We saw this on 12th January, 2012, at a Thursday afternoon matinee, in the Theatre Royal, Drury Lane - from the Leicester Square tube station, walk along Long Acre towards Covent Garden, turn right down Bow Street, and the theatre is to the left, off Russell Street. I can't remember what we paid for our tickets, but we must have got a good discount deal, or we would not have gone. I usually read all the theatre reviews in the Daily Telegraph, and store away mentally good reviews for likely future visits. Shrek, the Musical, didn't get all that great a review by Charles Spencer in the Telegraph, but he sort of enjoyed it as offering "an engaging couple of hours of family fun". I like Amanda Holden, who plays Princess Fiona in the the show, and I saw her on TV performing one of the songs from the show and liked that. So, although we didn't have any children with us, and weren't really Shrek fans (we hadn't seen any of the Shrek films), we did go along, and ended up really enjoying the performance. 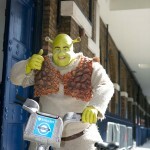 Unfortunately Amanda Holden was no longer in the show, but Ligel Lindsay was excellent as Shrek, the Ogre - such a winning smile, he was pleased to see us, and we were pleased to see him. The show was great fun, and performed with great vigour. The scenery was excellent, and like Wicked, a dragon flew around the theatre to gasps of amazement from the younger members of the audience. I thought there was plenty to entertain eveyone, young and old, it was a good storyline, colourful, and the music was quite good too. I enjoyed it more that Charles Spencer I think. It's a good show, and deserves to do well. We saw a matinee performance of "Singin' in the Rain" on Wednesday, 23rd January, in the Palace Theatre at the top of Charing Cross Road in London. Get off the Tube at Leicester Square, turn left out of the station, and walk up Charing Cross Road, and the Palace Theatre is on the left. We paid �70 for two discount tickets to the Dress Circle, seats H10 and H11. They were slightly further back than ideal, but the rows were steeply banked, and we had a perfect view of the stage. So no complaints, really. We got the tickets from seetickets.com, which gave us two allocated seats plus a seating plan. I'm sure we will use this website again. Adam Cooper played "Don Lockwood" ( = Gene Kelly in the film). "Don Lockwood" and "Lina Lamont" were a duo of very famous stars in the silent film era of the 1920's , only one of whom had the talent to switch to the "talkies" which were all the rage after "The Jazz Singer" film was released. "Lina Lamont" had a horrible squeaky voice that sounded terrible on a film sound track. Don meets a stage actress "Kathy Seldon", played by Scarlett Strallen, the oldest of the four Strallen sisters - this was the Debbie Reynolds part in the film. Kathy and Don fall in love. Kathy has all the talent that Lina lacks - and to save the day is persuaded to allow her voice to be dubbed on the sound track over a miming "Lina Lamont." You would have thought that Lina would be grateful, but no, she is a spiteful creature. She gets her just deserts in the end, and Don and Kathy go off into the sunset together. The third big part in the musical was that of "Cosmo Brown", Don's best friend and musical director - played by Daniel Crossley (= Donald O'Connor in the film). It was a good enough story line, and there was the fine singing and dancing that you would expect on the West End stage. There were lots and lots of well known songs - "Good Morning", "Make Em Laugh," and "Moses Supposes" being but three. The show stopper was of course "Singin' in the Rain" that concluded the first half. Cascades of real water "rained" down on the stage, and Adam Cooper got completely soaked, but danced on with a smile and a laugh throughout. He was dancing in about two inches of water. The orchestra had been wisely moved to up high, at the rear of the stage. Every time Adam kicked and flicked water into the audience, there were squeals from the front rows of the stalls, and laughter from the rest of the audience. A terrific set piece. The stage curtain remained up at the interval, and most of the audience stayed in their seats, fascinated to watch a troup of about six to nine stagehands cross and recross, time and again, with mops to dry a very wet stage. The stagehands left with applause from the audience. And then, at the very end of the show, we got a "Singin' in the Rain" encore, where all the cast got very wet, not just Adam Cooper. An unexpeced but most appreciated, generous treat ! All in all, a very good show. Adam Cooper danced very well - he had trained as a ballet dancer - and Scarlett Strallen had a lovely voice. As an aside, I hadn't realised there were so many Strallen sisters, all actresses. Scarlett is the oldest (1982), then Summer (1985), then Zizi (1991), and then finally Saskia (1994). Scarlett played Mary Poppins, and Summer played Maria in "The Sound of Music" - I'll need to watch not to get these sisters mixed up - but they are both terrific. I don't think I have seen Zizi nor Saskia yet. This is the new Andrew Lloyd Webber musical that opened in December, 2013, and which we saw on 22nd January, 2014. This was our first visit to the West End in 2014, so I thought I would probably open by redoing one of my "best ever of the year" jokes. The first cup of tea in 2014 was "the best cup of tea I have had all year", the first meal of 2014 was "that's the best meal I've had all year", and so on. So I had thought I would start by saying that "Stephen Ward" was the best musical I had seen all year. But to do so would be to malign this performance. It was a cracker of a show, a five star turn - and one of the best I had seen for many a long time. Lloyd Webber has done it again - but in a show with little dancing and no real show stopper hits. It's just a great story, a great cast, and consistently good and tuneful songs. We had managed to get two discounted seats in the dress circle (G11 and G12) for �39.50 each v. a �76.50 ticket face value, and had an excellent view. I did think that for Lloyd Webber, the absence of a big hit of a show stopper was a bit strange, and I didn't leave the theatre whistling anything. Perhaps "Too Near the Flame" which finished the show and was performed by the Stephen Ward character came closest - but it wasn't a soaring aria performed by a top rate West End Diva. I thought the production told the Stephen Ward story very well, and very sympathetically. Stephen Ward was a well connected Harley Street Osteopath with lots of friends in the aristrocy, politicians, gangsters, and the "London Scene" party-going set. The story takes place in 1963, and centres on the John Profumo scandal - Profumo's downfall was that he lied to Parliament. I thought that the first half of the production was the better half - but there was nothing wrong with the second half, it was just darker, less fun, with fewer jinks and capers. 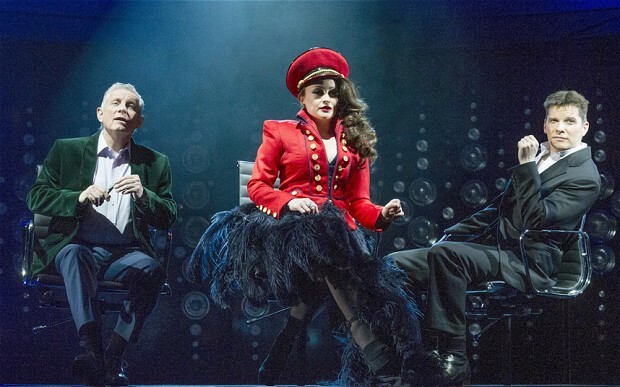 The first half was very upbeat, light and frothy, and introduced the three main characters Stephen Ward, Christine Keeler, and Mandy Rice-Davies perfectly. It was a terrific romp. The second half was more a story telling exercise leading to Stephen Ward's s downfall, abandonment by all his so called friends, and to his suicide. Stephen Ward was played to perfection by Alexander Hanson, Charlotte Spencer was a vivacious, beautiful and young Christine Keeler - you can understand why so many men fell for her charms - and Charlotte Blackledge likewise was an excellent Mandy Rice-Davies. Perhaps I have given a wrong impression about the musical content of the show by commenting on the unusual absence of a Lloyd Webber big hit show stopper number. A lot of the songs were charming, and very tuneful, and exactly right for the context. 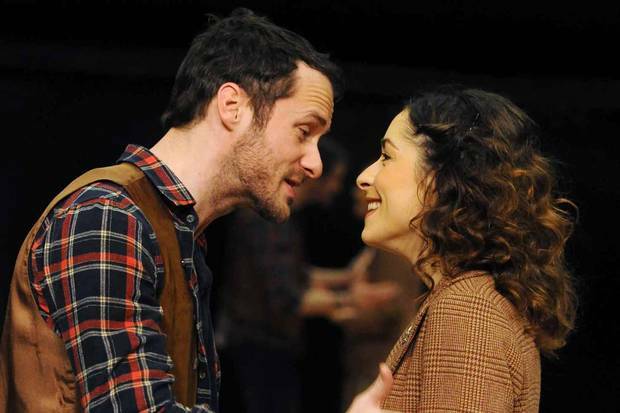 After Stephen Ward meets Christine who is a hostess at some seedy night club that he visits, he is beguiled by her, tracks her down and traces her to her mother's mobile home in the country. He then whisks her off to his county cottage in the grounds of his chum Lord Astor's estate, and together they sing the charming "This Side of the Sky" as Stephen manoeuvres Christine on to a cushion on the ground - but only to move her into a pose for a sketch that he does. There were actual Stephen Ward sketches of Christine and Mandy on display on the walls of the Dress Circle bar - I had wandered there at half time to further explore the lovely old Aldwych theatre. Another musical treat was the song "I'm Hopeless When it Comes to You" when John Profumo's wife debates with herself whether she should leave him or stick with him after Profumo confesses his unfaithfulness. All in all, it was a great story, excellently told and performed. I think most reviewers gave it four stars - but I thought it a five star show ! We saw this on 5th September, 2012, at a Wednesday afternoon matinee, in the Adelphi Theatre , in the Strand - from the Leicester Square tube station, walk down to Trafalgar Square, turn left into the Strand, and the Adelphi is a little way along on the left. We paid �73 to Lastminute.com for two discounted tickets in the dress circle. 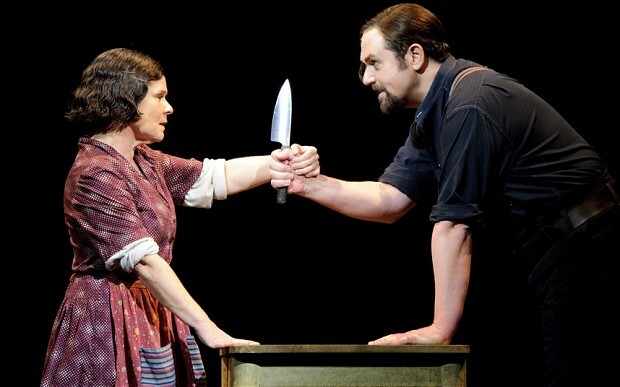 Sweeny Todd is a great Stephen Sondheim musical, telling the somewhat grissly story of the demon barber of Fleet Street, and supplier of the finest of "meats" to Mrs Lovett's pie shop. We knew the story, but I think we went mostly to see the stars of the show - Michael Ball, who took the title role, and Imelda Staunton, who played Mrs Lovett. I was intrigued to see how on earth Imelda Staunton, who doesn't have the strongest of voices, could possibly share the billing in a musical with Michael Ball. Michael Ball was in great voice - his voice was deeper than I had imagined it would be, but strong and glorious, and he can still hold a note. But the star of the show was Imelda, whose stage presence and acting ability carried the day. Her facial expressions were wonderful, and what a wicked cackle when she implied it would be terrible to waste all that meat. She turned her shop into a den of cannibals, and everyone including me, thought it was humourous ! It was quite a strong story - almost a love story between Todd and Mrs Lovett - and there were quite a few twists to the plot that I won't give away. All in all, a great show, and money well spent. I would certainly recommend it. We had booked two discount tickets to see The Bodyguard, paying �30 each for two �55 dress circle seats, for a matinee performance on Wednesday, 2nd October at 15:00. When we got to the theatre, we were upgraded by four rows to seats L19 and L20, from O19, and O20. Most of the seats to the side of us, and to the rear, were empty - indeed, we moved slightly further along the row to improve a good view to a perfect one. All the rows in the dress circle were well raked, and we would have been able to see perfectly well without moving. The show was 5 to 7 minutes late in starting, and the interval was about 40 minutes, with the second half also late in starting again. There were apologies, but no explanations. I wonder what the problem was ? The story is a very simple one. Tristan Gemmill plays Frank Farmer, a former Secret Service agent hired to protect a pop superstar Rachel Marron, played by Beverley Knight, from a dangerous stalker. Each expects to be in charge, and they don't get on to start with, but then fall in love, and then part when Frank's job is done. Why ? Within the tale there is a sub plot of a sister of Rachels, always in the shadow of her sister, who has always taken everything, and now takes Frank. I thought the story line could have been better developed - ie more plot, less singing, but I doubt if many in the audience would agree. I thought the film plot was better. The musical was more a catalogue of Whitney Housten songs - a pop concert. But it was well done, and well received. Beverley Knight has a great pop voice, and played the pop diva to perfection. I have heard better singing in the West End (eg Sierra Boggas in the Christine's aria of Love Never Dies), but never a better performance of pop songs. It was a simple story, and presented in such a a simple way, but they got it spot on. I liked the way the curtains opened vertically and horizontally at the same time to form a box giving a glimpse of what was behind, and then the box grew and we were into the action. Beverley faced back stage, and performed to an imaginary audience of her fans, and then turned round, and we became the audience, and she performed for us. So simple, and so effective. There were lots of big show numbers - "I Will Always Love You" and "One Moment in Time" were but two from many. I've seen better shows, but I've seen a lot worse too. For its kind, a succession of pop songs bundled together - I don't think they could have done it better, and in such a role, Beverley Knight was excellent. If you are into pop, or are a Whitney Housten fan, it's a must see. Otherwise, it's a good value for money, what's not to like show. We saw "The Pajama Game" at the Shaftesbury Theatre on Shaftesbury Avenue - a 3 pm matinee performance on Wednesday, 2nd July. For us, getting to the Shaftesbury theatre means getting off the tube at Leicester Square, (a detour for a quick cup of tea at the Crypt, St Martins Church), walking up Charing Cross Road, and turning right when we get to Shaftesbury Avenue. The theatre is a little walk away, on a corner, almost at Holburn. We had a good seat in the Royal Circle - two �63 seats bought at a 50% discount from See Tickets for �63 for the two. We were in seats G24 and G25. Surprisingly, the seats were already taken, but we soon sorted out the problem. The interlopers were in the correct G24 and G25 seats, but they should have been in the stalls. How can you mistake the stalls for the Royal circle ? It's a bit of an old fashioned story. A new superintendent , Sid Sorokin, arrives at the "Sleep Tite" pajama factory, and falls for the union rep, Babe Williams. Amazingly soon, they are head over heels in love with each other, but they both have opposing jobs to do. The old fashioned very capitalist boss of the factory refuses the union's claim for the 7.5 cents the hour pay rise being adopted throughout the sleep industry. There is a go slow, then a strike and Sid and Babe clash. But of course, its all sorted by the end. Although hampered by an old fashioned story line, it was a bright sparkly production doing its best alter a slowish start. The orchestra was great, real swing and some good jazz piano. Joanna Riding was full of smiles and sparkle as Babe Williams, and Michael Xavier was a dashing Sid Sorokin. Both had fine singing voices, as you would expect of a West End production. Garry Wilmot was also very good as as the time and motion expert. Its a well known musical, and there were quite a few classic songs - "Hey There", "Once-A-Year Day","Hernando's Hideaway" and "Steam Heat" Hernando's Hideaway was also the name of a swinging night club that the characters visited, and the night club visits really allowed the orchestra to let rip. But I didn't think that Sid Sorokin would have fallen for this Babe Williams at first sight although Joanna was an otherwise excellent Babe. Overall, though, it was all very well done - I would say 3.5 stars out of 5. We saw this on 13th June, 2012, at a Wednesday afternoon matinee, in the Savoy Theatre , in the Strand - from the Leicester Square tube station, walk down to Trafalgar Square, turn left into the Strand, and the Adelphi is a little way along on the right, along the turning into the Savoy Hotel. We paid �54 to Lastminute.com for two discounted tickets in the stalls. It's a simple plot. Hollywood star Danny DeVito, and UK star Richard Griffiths, play Willie Clark and Al Lewis, an old vaudeville double-act who worked together for 43 years, hated each other for 43 years, retired, and are now to be persuaded to re-unite 11 years later for a TV special. The setting is DeVito's squalid new York apartment. Both actors are absolutely terrific. 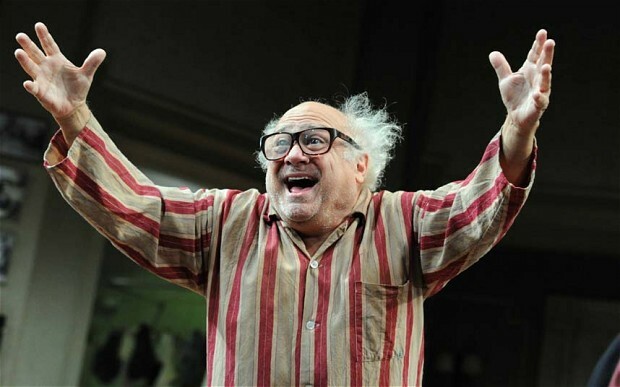 DeVito gets most of the lines, and is on stage all the time. Richard Griffiths comes and goes. DeVito carries grumpiness to a new level, and to say the two don't always get on is to somewhat understate the constant state of war being played out on stage. I thought it was a masterclass in fine acting from both actors, but perhaps especially from DeVito. It was a wonderful mixture of verbal conflict, but sometimes too we were caught out by surprising touches of bitter sweet tenderness - each actor pitch perfect. A 5 star performance and for once standing ovations were 100 % deserved. I have just lifted this picture from Daily Telegraph Review - hope no one objects. We saw this on 16th October, 2012, at a Tuesday afternoon matinee, in the Aldwych Theatre, Aldwych - from the Leicester Square tube station, walk along Long Acre towards Covent Garden, turn right at the end, down Drury Lane, and the Aldwych Theatre is at the end of the street at its junction with Aldwych. We paid �59 to Lastminute.com for two discounted tickets, seats P3 and P4, in the stalls. We were somewhat further back than we would have preferred, but it was a good seat, and we could see perfectly. I saw two reviews of this musical comedy in the Daily Telegraph. 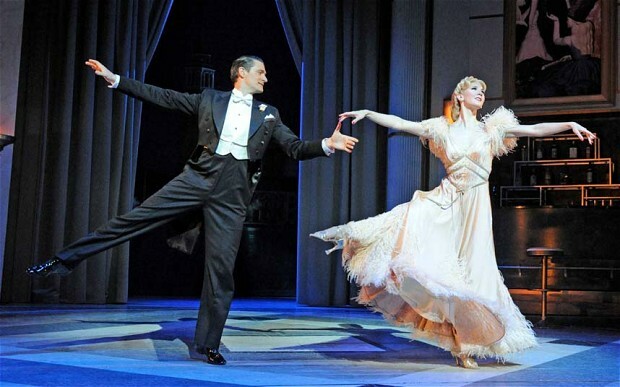 Tim Walker gave it a well deserved five stars, Charles Spencer only gave it four stars - mostly I think because he didn't think its lead actors, Summer Strallen and Tom Chambers quite matched Ginger Rogers and Fred Astaire, who, of course, starred in the original 1935 film. I thought Tom and Summer did a terrific job, as did the supporting cast, the dancing was terrific, especially the massed tap dance to "Top Hat and Tails", the comedy was good, the orchestra was good, and most of all it was a succession of great musical hits by Irving Berlin. It was utterly charming. I can't remember when last I saw a better musical, and I would give it five stars ! As per a lot of the classical musicals, there is not that much of a story - its just an excuse to link together some wonderful hit songs - "Puttin' on the Ritz", "Let's Face the Music and Dance", "Top Hat, White Tie, and Tails","I'm Putting all my Eggs in One Basket", etc. The story is about Jerry Travers, a musical star on Broadway who comes to London, and meets and falls in love with Dale Tremont. Dale falls in love with Jerry, but then mistakenly thinks that Jerry is married to Dale's best friend, and so backs off. There are lots of misunderstandings generating a lot of the humour, but of course, it all comes good in the end. I thought Tom Chambers sang, danced and acted excellently throughout. Of course he could not match Fred Astaire - who could ? Tom won Strictly Come Dancing, on BBC TV, in 2008. I think we saw and liked Summer Strallen before in "The Sound of Music", but perhaps it was her sister Scarlett Strallen ? I think she had taken over from Connie Fisher. She has the looks, the voice, and she certainly can dance. She is the complete West End leading lady package - she was terrific. The supporting cast were also excellent - Martin Ball and Vivien Parry as the Hardwick couple, Ricardo Alfonso as the fashion designer Beddinii, and Stephen Boswell as the creepy butler, Bates. All in all, two hours, forty minutes, of delight. And of course, most of all, the wonderful music of Inving Berlin ! We saw this on 2nd May, 2012, at a Wednesday afternoon matinee, in the Theatre Royal, Haymarket - from the Leicester Square tube station, walk along towards Piccadilly Circus, turn left into Haymarket, and the Theatre Royal is at the foot on the left. We paid �64 to Lastminute.com for two discounted tickets in the stalls. 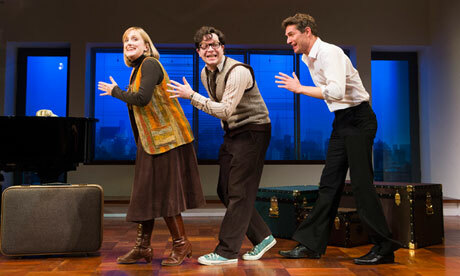 One Man, Two Guvnors got numerous rave reviews, and even two 5 star ones from Charles Spencer in the Daily Telegraph. The first was for a cast lead by James Corden which opened in London, and then took the show to Broadway. 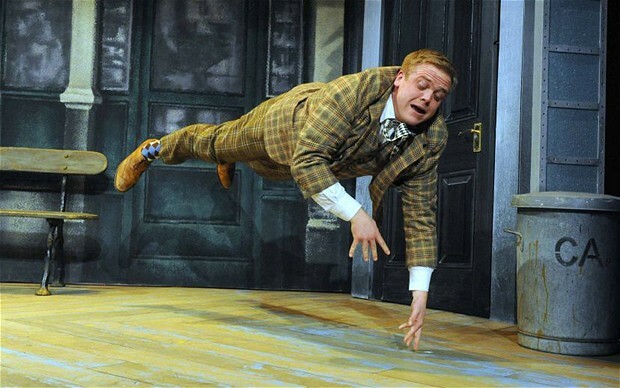 James Cordon had to be replaced, and so his understudy Owain Arthur took the part. Charles Spencer revisited, and reported that what he had previously thought would be impossible had happened, and that the new cast were every bit the equal of the old. Well, I thought, we must see this. For students of the theatre, this play is an updating of an old commedia dell'arte piece where for half the play the characters are consumed by hunger / motivated by a search for food, and then only once hunger has been assuaged, can man's higher feelings can come in to play. For most of us, though, this is just a deliciously hilarious play about misunderstanding and comic fine timing. Owain Arthur plays Francis Henshall, who works for an upper class twit who will pay him later (but I need to eat today ! ), and so to get money / food he gets another job working for a young woman disguised as her apparently deceased twin dead brother. Just like in a good pantomine, there is quite a lot of apparent hilarious ad libbing between Owain, and some members of the audience. I would like to see the play again to be sure that it really was ad libbing. Ravaged by hunger Owain says he would give anything for a sandwich. Was the performance that I was at really the first time that a member of the audience piped up with "I have a sandwich" ?. But it all looked genuine, and was ever so well done. There is even a great skiffle band apparently constructed by cast members doing party pieces.